Are you a travel lover? If you are, or have the experience of travel, you may know there’s an art to packing up. Backpack together with us can play an important role in the travel. Here, the tips will show you how to live a good life with your backpack. Before you travel, you shall pick a nice backpack carefully. If you are just going on a short trip, a day-pack should so just the trick. But if you are going on a long time journey, you may need something with a few more frills. 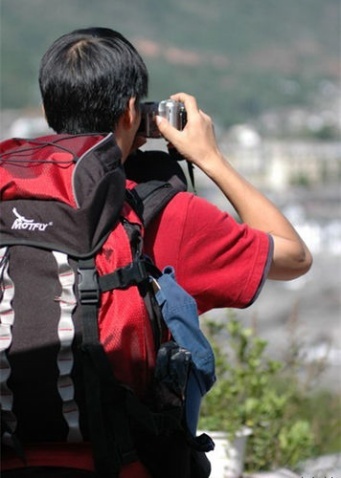 According to the different trips, you could choose most suitable backpack for yourselves. The size, shape, material also the internal structure shall be considered. Besides those factors, to make you feel relax during the travel, you shall pay attention to the factors below. Firstly, choose something lightweight, with a lot of compartments. Choose something lightweight, with a lot of compartments. You don’t want to add extra weight to whatever you’re carrying. Also, compartments are good for separating the dirty clothes from the clean, toiletries from everything else (in case of spillage), etc. For best support, find something with straps that run across your chest and your stomach. You may also want padding in the back to make carrying your load more comfortable. Think about size in terms of your backpack as a carry-on. When traveling in Europe and taking budget flights—Ryanair, Easyjet, for example— you can avoid the obscenely high charges for checked baggage by stowing overhead. Finally, buy a lock for your backpack. When you’re backpacking and staying in campsites or hostels with people you don’t know, you may feel more comfortable leaving your pack behind during the day if it locked, rather than if it was just open for all the world to see, take, and enjoy. Remember that you’re just going to having a trip other than moving house. You can pack your daily use, not all of them. But what on earth is necessary? There’s not much worse than having to carry around extra stuff that you don’t need or won’t use. Aim to pack the same number of underwear, bras, and socks to match the number of days you’ll be gone. If you run out for some reason—and can’t find water anywhere—turn them inside out and wear them again. Also, we can not foresee what we will meet with. It’s usual that people are injuried among the travel. So you could pack some medicine in your backpack. Oh, I almost forget the food. Yes, the food shall be mentioned. When living out of a backpack, it’s always good to have a small stash of non-perishable food—granola bars, nuts, dried fruit, etc. Don’t pack things that will melt in the hot sun or that can get super messy. Bringing a little something with you helps you to avoid buying excess food when you’re traveling. And always, always have a bottle of water close by. Finally, you could know about the destination online, some sightseeing place have their perfect Facilities such as restaurant and supermarket while other places, for example, mountainous area, has nothing. According to the information online, you can prepare other items if necessary.